Canine urinary incontinence – Why is this happening? We all know that canine urinary incontinence can be very annoying, but don’t turf your poor old dog out of the house just yet! There is probably a valid reason for your dog wetting in the house and it’s usually not just laziness. This situation is most likely completely outside your dog’s control. Dogs are clean animals and don’t normally soil inside the home, especially if they’ve been used to going outside. If your dog is suddenly wetting in the house for no apparent reason, there’s usually a medical problem that’s responsible. Canine urinary incontinence can be caused by a health issue such as a lower urinary tract infection which develops from bacteria in the dog’s bladder. Signs that a urinary tract infection could be causing the “dribbles” are difficulty urinating and/or excessive thirst. Other signs are a strong odor and dark colored urine. This of course needs treatment, so see your vet asap. Dog incontinence can have other medical causes which are less common than the above. The urethra could be blocked which is obstructing the proper emptying of the bladder and consequent difficulty passing urine. The blockage could be caused by stones or a growth – either cancerous or benign. If you have an older dog, chances are the canine urinary incontinence is simply due to age. Age can reduce the capacity of the bladder to hold the urine and the muscles used to hold the urine in can atrophy and become weaker. Both these situations will cause wetting to be more frequent. There are also diseases caused by aging, such as canine arthritis, which will affect a dog’s ability to move around and could also prevent him from getting outside in time. Patience is needed in these situations and perhaps some waterproof covers where your dog normally sits and sleeps. Canine urinary incontinence can occur in female dogs after they have been de-sexed that is known as spay incontinence. This usually develops gradually after the dog has been spayed. There are some canine diseases which may cause incontinence, such as kidney disease or Cushings disease. Diabetes is a frequent cause of dog incontinence due to the dog being thirsty more frequently and causing more frequent urination. Although there is medication that can tighten the sphincter muscles to control canine urinary incontinence, herbal and homeopathic remedies work just as well and without side effects. 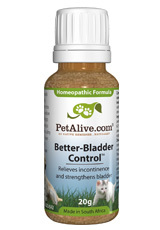 Native Remedies Better-Bladder Control is formulated with natural ingredients that relieve incontinence and strengthen the dog’s bladder. Better-Bladder Control can manage symptoms such as frequent urination or dribbling, while also strengthening the urinary system and helping to maintain bladder control. 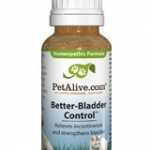 Better-Bladder Control also helps to detox the dog’s body at the same time. So just bear in mind that normally a dog will not voluntarily urinate inside the house unless he can’t help it. Be patient with him and always investigate the cause of canine urinary incontinence as soon as possible.